If you are new to aromatherapy and want to save money yet still use the same high quality essential oils the professionals use, then this great value Essential Oil Kit is just for you. 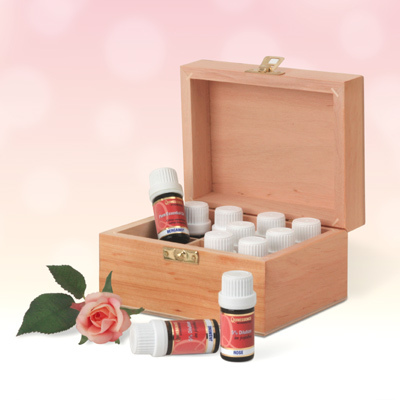 This specially created kit contains precious oils of Rose 5% and Jasmine 5%, together with 10 of the most versatile essential oils to help you create a wide range of health-enhancing blends. To keep your oils in tip-top condition we have included an attractive hand-made Alderwood Storage Box which protects them from light and heat thereby prolonging their shelf-life. All the essential oils have been sourced by experts and are guaranteed 100% pure, - PLUS you get a 10% Discount off the regular price of the entire kit! And best of all, the price includes delivery to your door! Order your Essential Oil Kit now, and you will be able to start enjoying all the great benefits of aromatherapy within days - whilst saving money too!